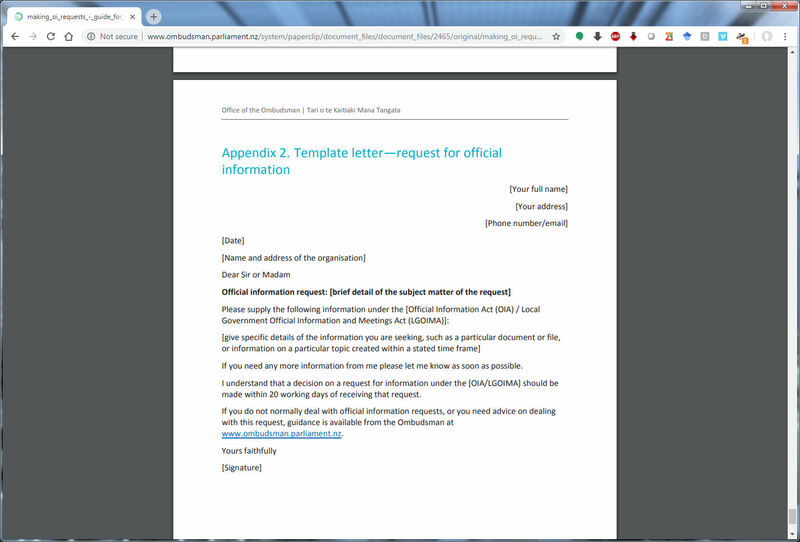 Recently, after asking a government department for some information which I knew they held and being told that they couldn't/wouldn't give it to me, I decided to try getting it using New Zealand's Official Information Act (OIA). Firstly, I had to find out how to apply under the Act. Having thought that I would have to apply via the Ombudsman, I was surprised to see that - at least initially - I apply to the government department itself. It doesn't seem to be that hard to apply (though whether I will get a response is another story, as I am still waiting). 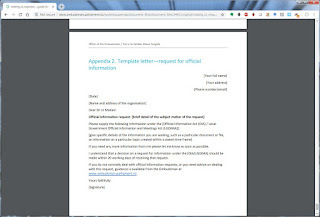 There is a great guide online here, and on page 24 of Appendix 2 is a template "request for official information" letter for us to use to obtain what we are seeking. The document online sets out some criteria for our request being granted. In general, unless the department has a good reason for withholding it, the information should be provided if we ask for it. This is called "the principle of availability". The idea is that official information should be available for NZers to "participate in decision making more effectively"; and we do have to be a NZer or a permanent resident. This surprised me, as I had not stopped to think about information as being a privilege of citizenship, but it makes sense. It is our collective taxes which have paid to collect the information, after all. We can make a request for official information from any central government departments and organisations, asking for any "information held by an agency in any format, such as: written documents, reports, memos, letters, notes, emails and draft documents; questions which can be answered by providing information already known to and held by the agency (official information); and data" (Office of the Ombudsman, 2016, p. 7). MBIE compiles New Zealand’s monthly “All Vacancies Index” from data collected from TradeMe Jobs, Seek, the Education Gazette and Kiwi Health Jobs. I want to find out how large the percentage share is from each of the four participant information suppliers into that All Vacancies Index. I suspect that it is something like 55-60% of jobs are found on TradeMe, 35-40% on Seek, 1% Education Gazette, and 2% Kiwi Health Jobs, but would like to know how accurate my guess is. Both TradeMe Jobs and Seek are owned by Australian companies. I want to know because I find that my clients generally look only on TradeMe Jobs. My instinct is that TradeMe is the larger platform in New Zealand, but I don't know that. I have been unable to find any information on the platform size since 2010 (when TradeMe became larger than Seek for the first time). I suspect that TradeMe jobs is much larger than Seek now, but without evidence, I cannot provide my clients with good advice. It is currently day 4 of the 20 business days that MBIE is supposed to supply the information within. I will update you when I hear what the result is. Thanks for your feedback. The elves will post it shortly. © Sam Young, 2014. Powered by Blogger.